On the menu that pops up, pick Project Templates. Then choose Horizontal and one of the sample banners to the right. Determine where you want to save it. You should be left with a screen similar to this one. In the left sidebar, towards the bottom, click the text across from the word Text. Change the Go to URL to something that appeals to you. Find an image you want to add to the banner. It should be copyright free/public domain. Morguefile is a good source of this sort of images. Edit the picture down to somewhere close to 234*60 in order to fit it in your banner. 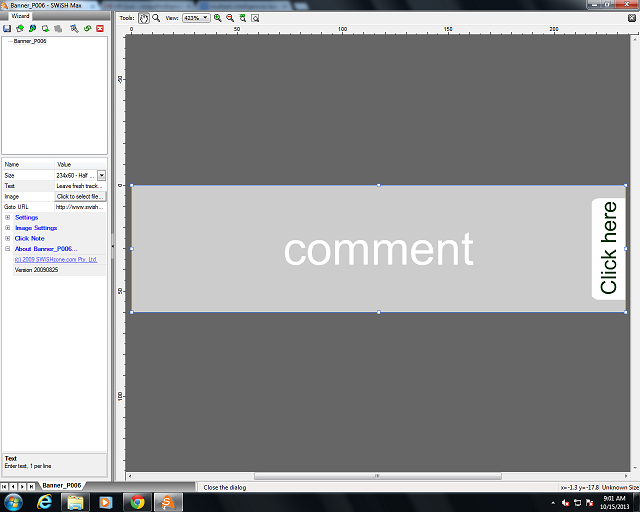 In Swish, click the button close to the word Image, and load your image in. Now way up at the top, under the word Wizard, there is a series of 8 buttons. Click the one fourth from the left to see a preview of the banner you have just created. If the animation is driving you crazy, the button fifth from the left turns it off. Don't forget to save you work regularly (the button first from the left). When you think you have it in order, press the Publish button. It should create a .swf file along with the necessary HTML code.